Divine Balance, Harmony, and Order, I honor you. Now that the Sun has entered Libra, the breeze is getting crisp and I want to celebrate the realm of Air—the realm of mind. Our thoughts and ability to detach, objectify, and conceptualize, as well as communicate and relate to others, live here. Often these qualities, especially the ones of intellect, are criticized. I hear people complaining that they are too much in their heads or that they can’t turn off their thoughts. It is common be ashamed of our own intelligence or ability to reason. And I get it; it can be overdone. However now, in this season of the Scales, I want to claim all that is good about the brain. Hail to the Mind. I recently attended a concert of medieval vocal music. The harmonies and blendings of the choral group were amazing. The order inherent in the medieval compositions approached the sublime. The intricacies within the music were delightful. I came to the concert with worries and concerns from my life. I left it in an exalted state, feeling as though I could solve those problems. The artistry elevated me, but I also appreciated the effect of harmony, blending, and intricacy on my soul. Libra is the sign of such qualities, and this lunar month is a good time to honor these qualities in ourselves. Libra’s scales are a symbol of balance. They also stand for duality, judgment and weighing our options. Are any of these issues giving you trouble right now? The reason may be that Saturn, the planet that loves to give us good solid work to do, has been transiting though Libra since October 2009. Recently Saturn has moved into a new region of Libra sparking new challenges to use Libra qualities in even more exquisite ways. (See how I am framing Saturn in a positive light? I’m trying to seduce him into thinking he doesn’t have to torment me anymore.) People with planets or important points between 18 degrees and 29 degrees of Libra or the same degrees in the other Cardinal signs, will be visited by Saturn this fall and early winter. My Sun occupies this area and I am thinking that I need to pay more attention to Libra. It is time to appreciate my mind. Every element has its purpose. Air reminds us that our thoughts can create reality. It is a powerful tool and is possibly the hardest to use intentionally. The forces of chaos and order dance together within this realm. Both are real, both are necessary. I am wondering however, in my own desire to live in balance I may overcompensate and not allow these energies to flow freely in my life. 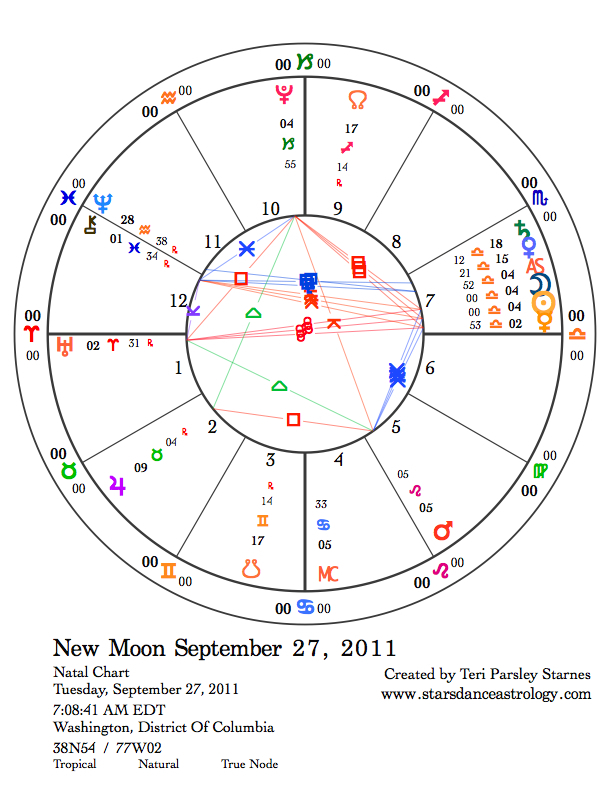 This New Moon cycle starts off with a great opportunity to practice balance between order and chaos. 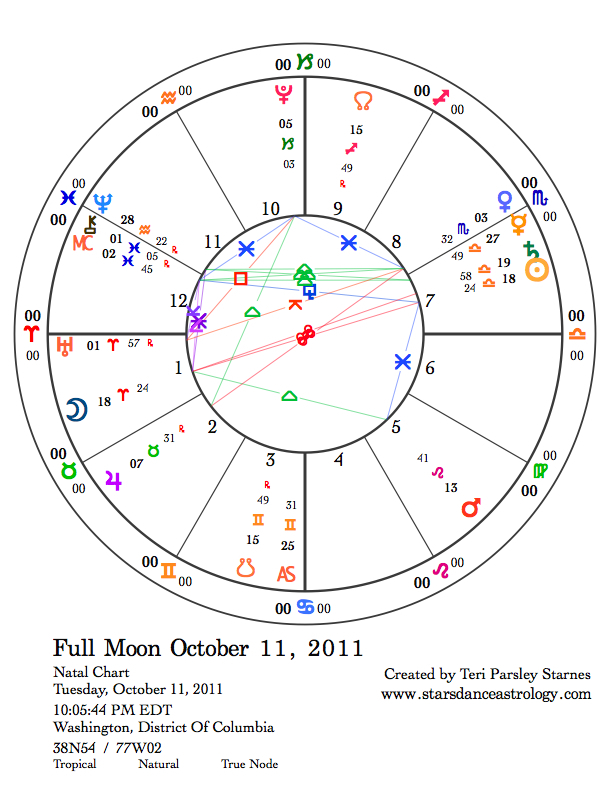 The lunar month starts with the crackle of a t-square involving Pluto, Uranus, and the Sun and Moon. Possibly the most interesting part of this t-square is that it also involves an exact opposition between Uranus (master god of chaos) and Mercury (master god of mind). Oppositions can create a crisis that provokes integration. Uranian transits often feel like lightening bolts and Mercury shows us how tricky our minds can be. With Pluto involved in this, there is potential also to experience this lunar month as deep and transformative. Mars is involved in this story as well. Mars increases impulsivity and also carries the energy of the lightening bolt. 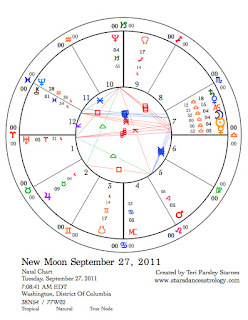 At this new moon, Mars is in Fixed Fire—Leo—quincunx to Pluto and square to Jupiter. The quincunx aspect represents what we don’t easily see. Imagine a lightening bolt coming out of the blue. As if a t-square configuration isn’t challenging enough, our wills, our anger, our passions just may set off the storm of transformation. Is this an opportunity for embracing chaos or creating order? For sure, it is an opportunity to observe our patterns and investigate how we might want to change them. When the mind is emphasized it is too easy to forget about the body. Even as I am writing this, I am noticing that in an effort to express my thoughts I have a tendency to contort and hold my body in positions that can create pain later. Perhaps this dynamic is one of the most important when we strive to achieve balance in the mind. The body is here too. Jupiter has been in Fixed Earth—Taurus— since June (and stays until June 2012). Jupiter’s job is to expand our experiences past previous paradigms. Sometimes this can be exhilarating and sometimes overwhelming. The square between Mars and Jupiter could manifest as an overwhelming need to remember the body in all this. Transits between Jupiter and other planets are an opportunity to invite in the body’s awareness. Jupiter in Taurus wants us to bring the body along on our mind trips. My favorite part of the New Moon chart is a conjunction between Libra’s ruler—Venus—and Saturn. Saturn expresses himself well in the sign of Libra. All the best qualities of mind are exalted by this planet of focus and intention. Venus’ position here reminds me of the goddess Sophia. She represents Wisdom. In Sophia, we encounter the hidden law that creates order out of chaos and invites us into the grace and beauty of harmony. The Wisdom book in the Apocrypha describes Sophia: “For she is more beautiful than the sun, and above all the order of stars: being compared with light, she is found before it.” This meeting of Saturn and Venus is an opportunity to walk with this inspiration this month. 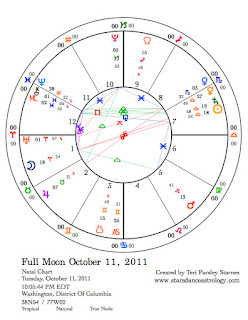 The Full Moon chart is less tense. The predominant story at the Full Moon is the conjunction of Saturn and the Sun, which is of course also opposite the Moon in Cardinal Fire—Aries. Saturn continues to encourage us to focus and define the qualities of mind that serve us best. The Aries Moon interjects urgency, much like Mars did earlier. What did we learn from the first two weeks of this lunar cycle? How can we integrate the passion to act and the wisdom to consider our best choices? May the beauty, balance, and wisdom of Sophia guide us.